Leather Items & Leather Gifts make a smart and powerful statement. 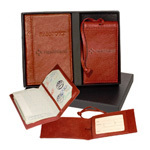 Leather Portfolio: Specializing in Custom Leather Binder, Business Giveaways, Custom , Leather Binders. 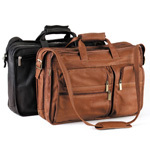 out-of-the-ordinary leather gifts that fit your budget and your recipient.Think tasteful leather wallets, handsome leather laptop backpacks, leather briefcases, leather travel accessories and other distinctive options. 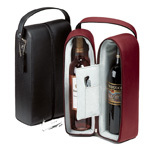 We customize all your leather gift items to make them even more personal. Customization includes stamping or debossing. Spending more for an important client or colleague,goes far for that great impression. 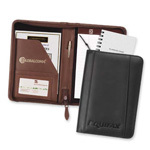 We also have corporate leather items that are appropriate for business men and women, such as leather document holders, leather giveaways, leather travel gifts, leather sets, leather luggage tags, and leather luggage that can all be customized with your company name and logo for ultimate brand exposure. Select your favorite leather promotional gifts from our collection, with plenty of time allotted for customization and shipping: about 14 working days. 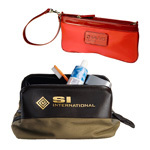 Then count on long-lasting visibility for your company name or message whenever your leather gift is used.